Tuesday night's keynote address to the Democratic National Convention will be delivered by one of the youngest members of Congress, 30-year-old Rep. Harold Ford Jr. of Tennessee. Although Ford is regarded in media and political circles as one of the fastest rising stars in the House of Representatives, he is virtually unknown to millions of U.S. households, many of which are just now paying attention to the looming November battle for control of Congress and the White House. Yeah, you're right, that was the 2000 keynote speaker - but wait for the comparisons, they'll come. Some other comments from the CNN story linked above are also just a few details off of being relavent again. 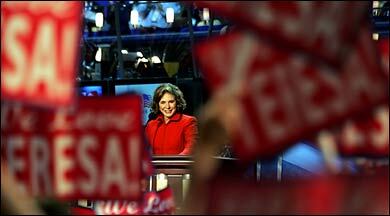 In 2000, Bradley was the alternative candidate that was still popular and prominently featured at the convention. Tonight, we had Howard Dean. In 2000, I was in Staples Center to hear Harold Ford, Jr. (someone I'd see previously, in 1996, in DC, address our group of young leaders as an impressively young leader himself) - and I liked what I saw. He may not be a household name yet, but maybe someday. Tonight's keynoter, on the other hand, is less worried with being a household name nationally than he is with being an household name in Illinois. He's the Dem nominee for US Senate there – Barack Obama (we’ve talked about him before). Tonight was the first time I’ve seen this newest phenom in action, however. He’s got a great American Story – the son of an immigrant Kenyan and his Kansas-bred wife, he began his speech by invoking classic American dream imagery, American as a beacon of opportunity, etc. His father was a goat-herder, his maternal grandmother was a WWII Rosie in the factories. He mentions that his name was given in a country where a name is no barrier to success. I couldn’t help but think how in some cases, it can be a be a key – think of the stars (ballot and box office) who’ve re-embraced their ethnic handles. Obama was a competent speaker with a compelling story – he moves a bit too much on his feet, his hands fluttering and punctuating in a manner that probably works better with Rotarians than it does on a national broadcast. 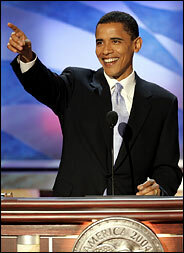 Toward the end of his speech, he warmed up, got looser, and seemed comfortable enough to raise the energy level. He highlighted his “fundamental belief: I am my borther's keeper, I am my sister's keeper.” He even quoted cash – E pluribus unum - and they say Dems ignore money stuff. But, fundamentally, I agree with his point, so I’m willing to cut him some slack (in the spirit of bipartisanship, since I cut Obama some as well). One coverage note, at this point - you'd think C-SPAN would do better than highlight the "stars" for many of the reax shots. I don't know which Baldwin I just saw, but he needs a haircut and probably a bath. Teresa Heinz was introduced by both the warm and fuzzy video and her son, Christopher Heinz – all in an effort to take the edge off her “shove off” persona. It was good – perhaps not totally effective. But despite her lack of Elizabeth Edwards’s warmth, Teresa carries a quiet gravity that came through in her life story – one that made a nice companion piece to Obama’s earlier speech. Her son may have tried to win over some voters with stories of packed lunches and applied band-aids, but it speaks well of the delegates that her riffs on the noble opinionated woman and the march against apartheid garnered more honest approval than the hidden-domestic-goddess anecdotes. Normally, I can’t stand slow talkers, but when I finally relaxed and just listened to her, I saw the power in how she was saying (note I didn’t say “what,” though that comes too, in parts). She gave a girl-power shout-out, hoping that one day women would be called smart and well informed like men, instead of opinionated like – uh – Hillary Clinton (who, by the way, was stony and petulant in each C-SPAN supplied reaction shot). It’s also worth noting that she wears completely nonsensible shoes – slender heel, pointy toe and all. Brava. For supporters of a new fuel economy like me, she offered her husband’s belief that “alternative fuels will guarantee no American boy or girl will go to war because of our dependence on oil, [and] that our economy will forever become independent of this need.” Sounds good to me. She closed with Lincoln (another Obama/Illinois connection) and the better angels of our nature just waiting to be summoned – and guess who’s ready to do the summoning? What surprised me most about tonight’s prime time line up – was that by the end, despite the painfully obvious stagecrafting and over-prepared speakers – I had managed to put aside blogging, race handicapping, punditing, and any attempt at even analysis (ie: what are the other guys going to hit us on about tonight?). By the end of Teresa’s speech, I had stopped watching as Phoblographer*, critic, and started watching as cd, lifelong Democrat, desperate for change. In short, I was, for at least a brief moment, ready, willing, and looking forward to voting for Kerry – not something I’d have expected Teresa to inspire. In truth – it’s the greater event influencing me – Clinton’s stellar speech and remembering fondly all the past conventions of my lifetime: laying on the living room floor, coloring in a map of the country, looking for my Dad in the 1984 San Francisco crowds, riding the Red Line back to my motel after Gore’s speech in 2000. Conventions aren’t newsworthy. They aren’t going to solve the problems. They won’t fix Kerry’s problems, nor force people to believe that Bush lied. But they remind us – Democrats – who we are and why we are and where we want to go. Unabashedly, proudly, obstinately donkeys. All of us. The trick is getting this feeling to stick for the next 100 days.